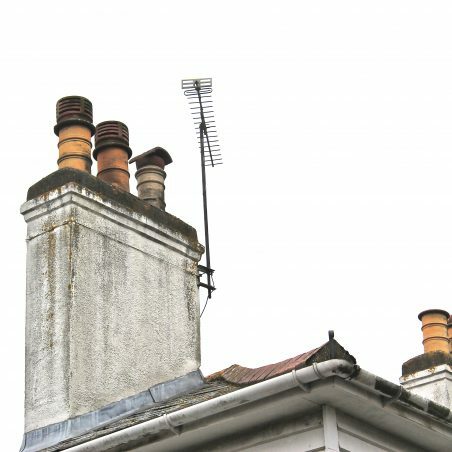 A close up of one of the two chimneys. 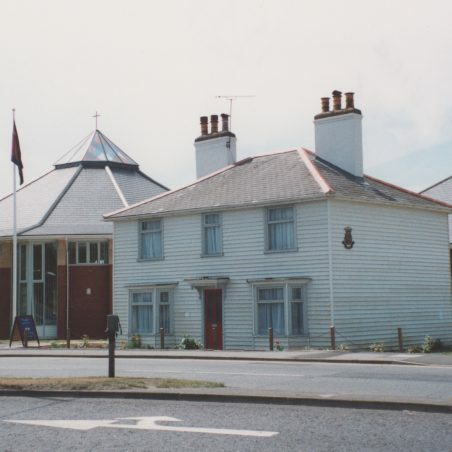 This photos shows the cottages by the original Salvation Army buildings. The cottages with the new Salvation Army building. 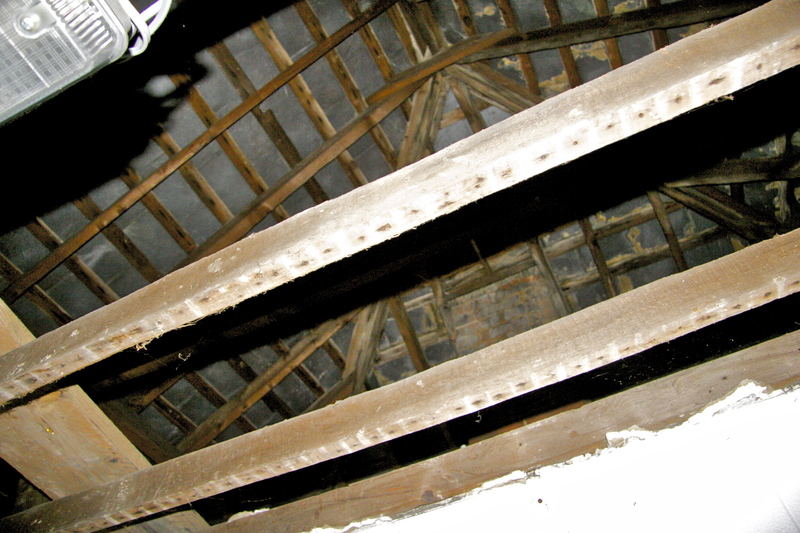 The inside roof of the building May 2016. 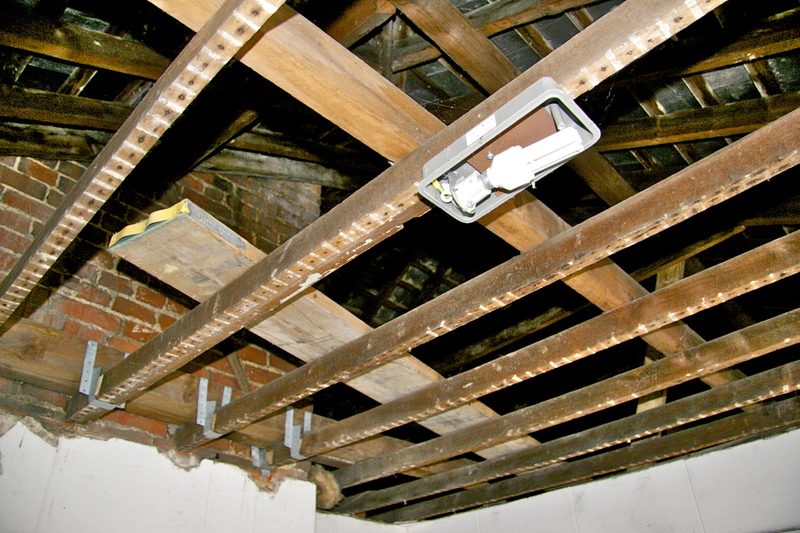 A further views of the beams, May 2016. 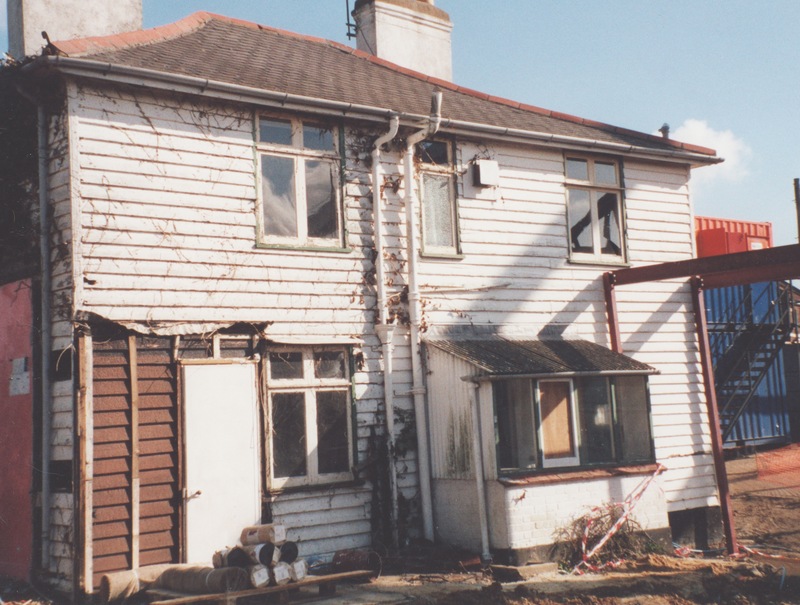 This late 1980's photo show the cottages in a poor state of repair. 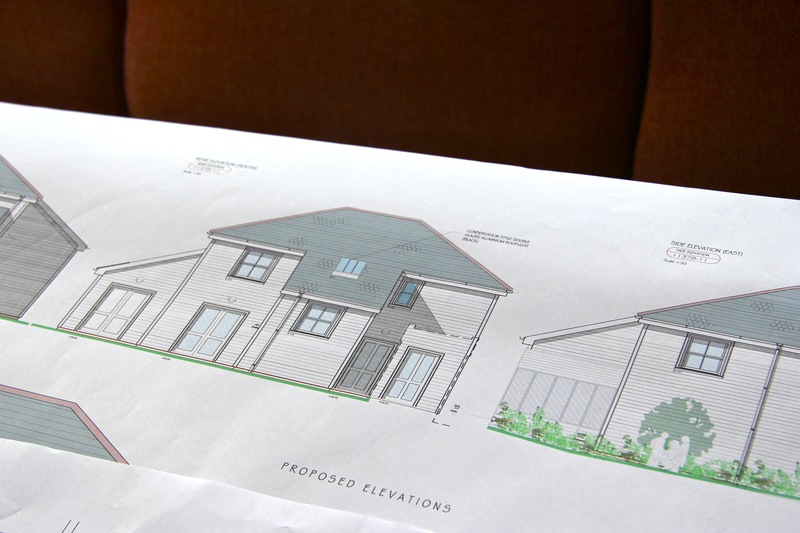 The new build plans, May 2016. On the 16th March 2016 some of the archive group, with the help of Major Geoff Ashdown, entered these rather neglected cottages. 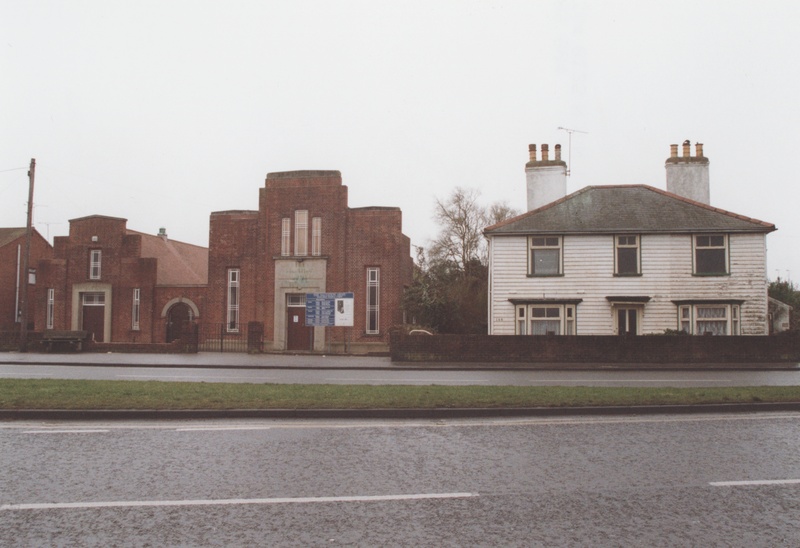 They are situated in front of the new Hadleigh Temple Salvation Army Church on the London Road, but are due to be demolished and replaced by a new look cottage, keeping to the style and appearance of the one being taken down. Not much is known about them. They are certainly very old; they have no foundations and look in need of urgent attention. Let us see what we do know. 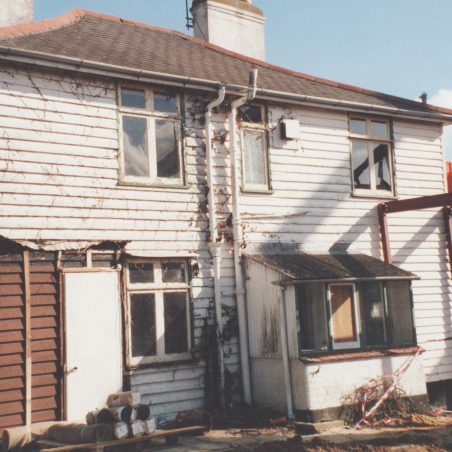 Brigadier Gardner was the last person to live here, in the Westerly let, prior to going into care in 1994. The property was then used as the corps charity shop for a short period. 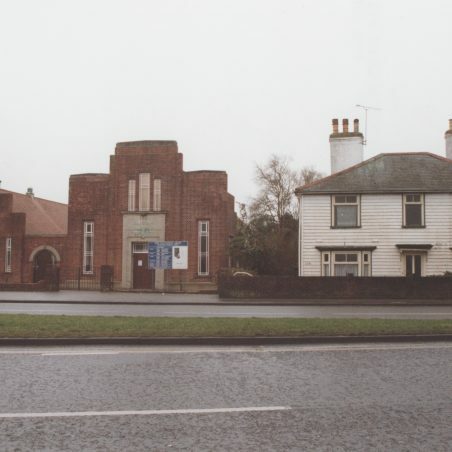 It remained empty until 2000 when work began on the new Temple building. 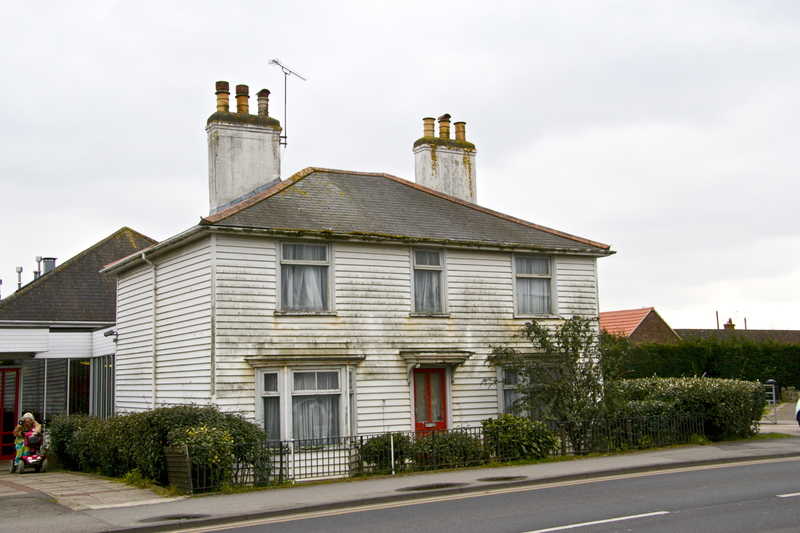 The Easterly let was occupied by George Halls, a farm worker on the colony. 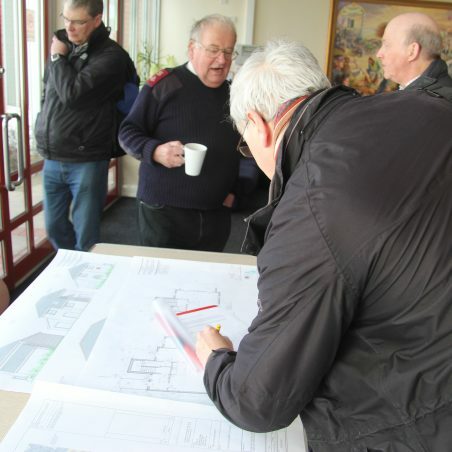 He moved into Florence Gardens in 1999 to facilitate the work on the new building. 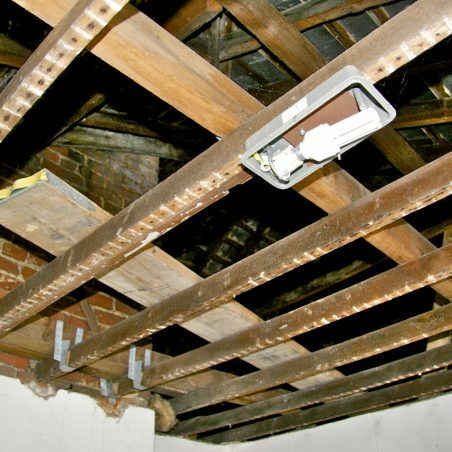 The builder used the empty cottages for storage and offices until the new buildings were completed. 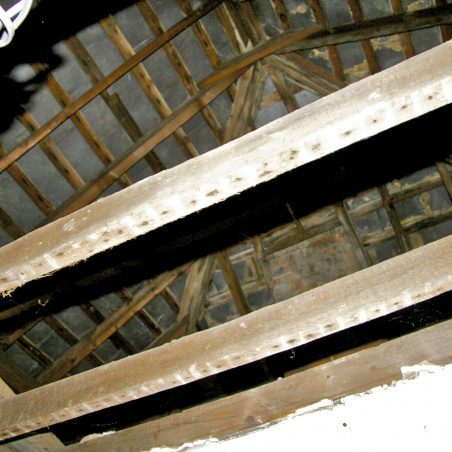 The age of the cottages is uncertain; they are on the local list but CPBC have been open to suggestions about restoring them. 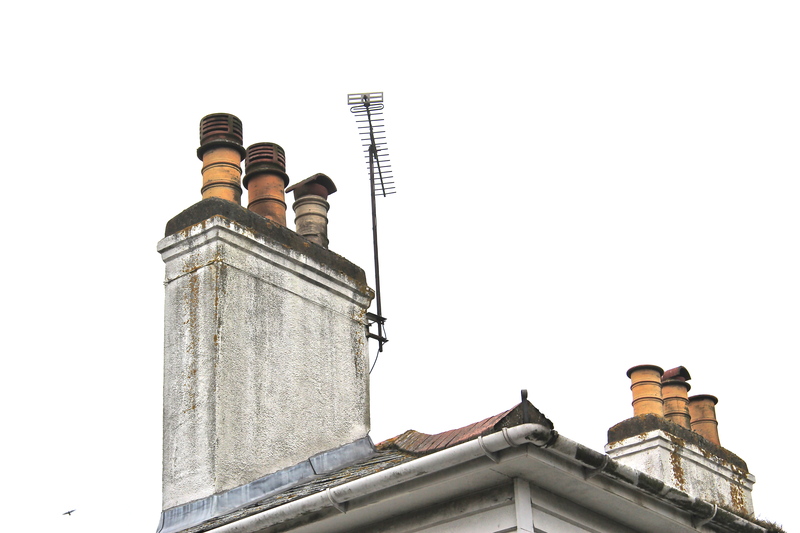 Distinguishing features are the two unusually large chimney stacks. 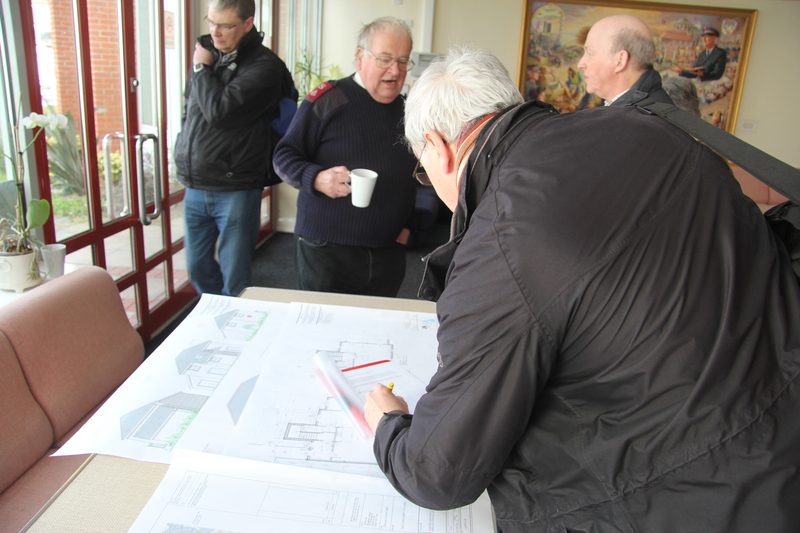 However, approval has been granted to take down the existing building and build a replacement. 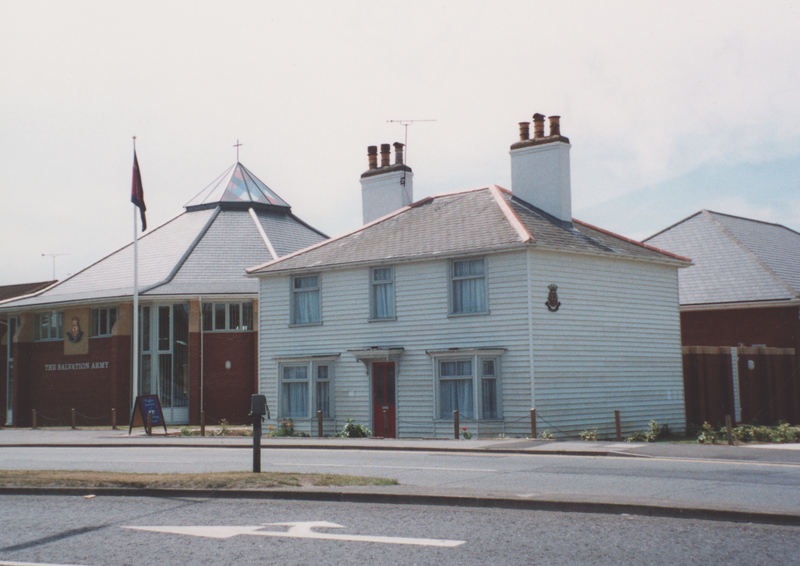 The Salvation Army would then use the building as an extension of their work here in Hadleigh. The Salvation Army came to this site in 1938 when the original buildings were erected by L. Upson & Son. The Citadel on the Farm Colony had been in existence since William Booth moved to Hadleigh in 1891 and was the main place of worship. The decision was made to relocate to the main road. There was some resistance to this decision from the Colonists and the last recorded meeting on the Farm Colony was in 1969. 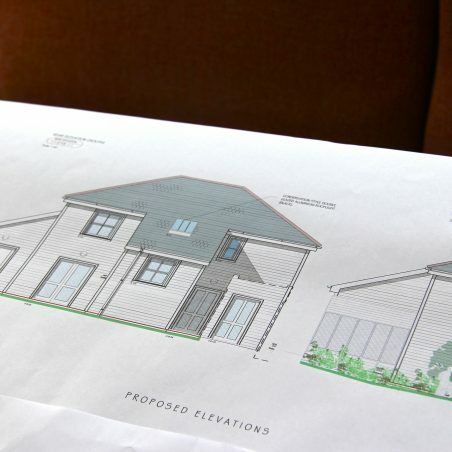 Redevelopment work on the cottages is expected to start in the summer of 2016. 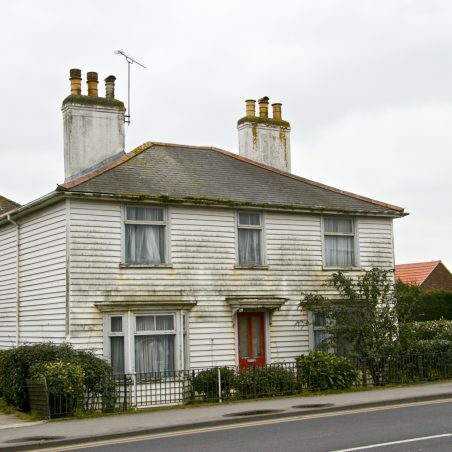 Regarding your comment about the weather-boarded salvation army cottage, I was very sorry to see it was recently pulled down, yet another piece of history gone from Hadleigh.